The sticker shock of college tuition, room and board typically comes at a time of great emotion as we realize that not only have our kids grown up in the blink of an eye, but the costs for their next phase are, in many cases, more significant than planned. The Tuition and Fees we’ve listed is the National Average according to The College Board. Now in addition to tuition and fees, there is Room and Board. There are dorm costs where meal plans are offered, or your child may decide to live off campus and rent where a budget for meal costs will have to be determined. Then you add in Books and Supplies. Yearly books and supplies for an in-state school is estimated for the average full-time undergraduate student at a four-year public college to be approximately $1,240. This is for new books. Used books can assist in lowering this cost and many colleges offer a rental option for books. Then, add to this Personal Expenses that are often overlooked such as laundry, cell phone, eating out, entertainment, etc. It’s important to put a budget or spending guardrails on these types of expenses for your kids. And finally, Transportation. Will your child commute via car, bus, airplane? Also, if you’re driving them to school, how far is it? How often will you plan to go and consider the costs of gas for your car as well. Financial aid such as federal loans, grants and scholarships and of course possible tax-credits or deductions can make a big difference in what is actually paid for college. There are also work-study programs where students can gain part-time employment to help pay for part of their college costs. As your child progresses in high school, you’ll learn of the importance of the FAFSA during their junior year, to be completed early in their senior year. This is the application for Financial Aid or Free Application for Federal Student Aid. You can also apply for financial aid directly from the colleges you apply to. The CSS/Financial Aid Profile form is often used for the direct submission to the college or a private organization. Both the FAFSA and CSS/Financial Aid Profile open on Oct. 1st of each year for parents to complete for their child planning to attend college the next year. Important note on the FAFSA application – Yes, even if you think you may make too much money to qualify, it is recommended that you complete this application. It’s the form that is used to award grants and scholarships, and it is required for any federal loans. Now, if a student loan is being contemplated, here’s some food for thought. As Financial Planners, we’ve seen a lot. One thing we’ve seen far too often is the situation that arises when parents have taken out student loans themselves, often called Parent Plus. We find the parents looking to retire yet unable to do so, in large part, due to the mountain of debt they acquired sending their kids to college. Or, the dream they had of their retirement days has changed significantly due to this debt. In addition to the Parent Plus loan, there are also other ways parents have borrowed, such as home equity loans, personal loans, etc. All of these loan options (including the Parent Plus) mean that the PARENT IS 100% RESPONSIBLE FOR THE DEBT. Amazingly, parents don’t always think about that fact when signing. As planners, we see this far too often. You see, if you take on a sizeable debt like this as you are nearing retirement (15-20 years away for most) instead of increased savings at a time when you need it most, you have decreased savings and significantly increased debt. Incredibly, many parents just don’t think about this. And, it’s a BIG problem. College costs have risen fast in the last decade and continue to rise. 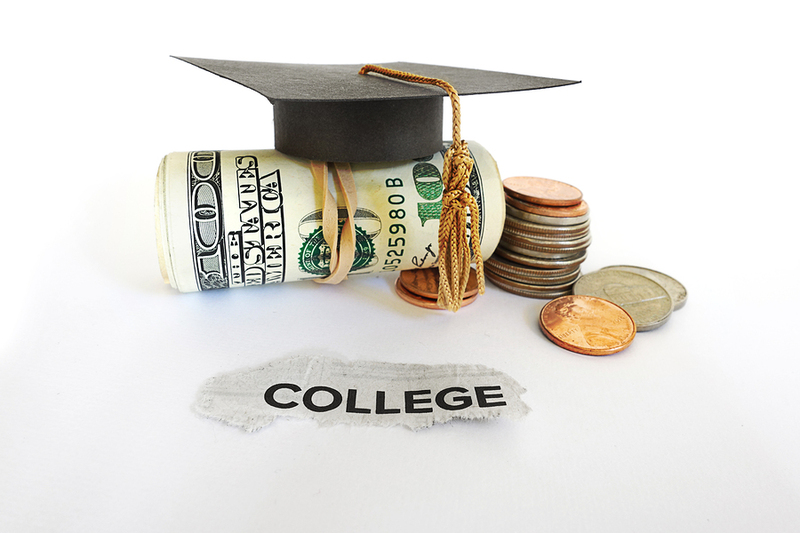 As a parent, if you haven’t been able to save quite enough for college, it’s understandable. But, what should be MORE understandable is the fact that you only have a little more than a decade until you reach “retirement” age to pay off the debt, while your child has more than 4 decades. Enrollment in a community college for a year or two to save a bit. Your child might get involved in a work-study program. Help to set your child’s sights on a lower cost college. Do your homework and ask your child to work with you on the myriad of scholarships both locally and nationally that your student might apply for. So, considering the 5 main categories to college costs is step one, and that second step is creating a budget along with your child for those personal expenses and for board if they plan to live off campus. And the third step is to think about sharing the responsibility of college costs with your kids. It’s come to be such a big expense that it’s nearly impossible for most to do it alone. Important Note: The views expressed in this post are as of the date of the posting and are subject to change based on market and other conditions. This post contains certain statements that may be deemed forward-looking statements. Please note that any such statements are not guarantees of any future performance and actual results or developments may differ materially from those projected. Please note that nothing in this post should be construed as an offer to sell or the solicitation of an offer to purchase an interest in any security or separate account. Nothing is intended to be, and should not be taken to be, investment, accounting, tax or legal advice. If you would like investment, accounting, tax or legal advice, you should consult with your own financial advisors, accountants or attorneys regarding your individual circumstances and needs. No advice may be rendered by Lenity Financial, Inc. unless a client service agreement is in place. The College Board, CollegeIllinois.org, Lenity Financial, Inc.